My French Film Festival… don’t miss it! MyFrenchFilmFestival.com is an innovative concept the aim of which is to showcase French directors and enable Internauts all over the world to share their love of French cinema. For its fourth edition, the festival returns with new films, new foreign languages, new partner platforms and launches in cinemas in several territories. Between 17 January and 17 February film lovers all over the world will be able to access all the films proposed by the on-line French film festival. As an avant-première, the shorts can be viewed this year free of charge on 21 December within the framework of the Shortest Day, in celebration of short films. Ten French features and ten French shorts are competition. Internauts are invited to score all the films and leave their comments on the website. The selection includes two Belgian films in competition, as well as, out of competition, one heritage film and two Canadian films in French. The festival, including both the website and films, is available worldwide in 13 different languages: Arabic, Chinese, English, Finnish, French, German, Italian, Japanese, Polish, Portuguese, Russian, Spanish, and Turkish. As of 3 December 2013, Internauts can view free of charge exclusive interviews with directors and actors, as well as film trailers. Where to see the films? On the platform myFrenchFilmFestival.com for all countries, the festival being equally available on twenty other partner platforms, according to the territories, including iTunes in more than 80 countries. All selected films will be available from the French Institutes abroad via the platform IF Cinéma as of 17 January, with showings in the cultural network’s cinemas. The films will also be proposed to 400 airline companies via our partner Skeye for inflight projections, as well as more than 1,500 art houses worldwide, thanks to the network of our partner SpectiCast. The list of projections will be available on the website myFrenchFilmFestival.com at the end of December. Internauts worldwide can vote for their favourite films on the festival’s website. 100 film buffs from all over the world, influential on Facebook and Twitter, vote for their favourite films. 11 journalists from major foreign dailies vote for the winning films. The filmmakers and international press juries will meet together in Paris during the festival to vote on the winning films. The award-winning films will be shown on Air France flights for a duration of 6 months. In France, only the shorts are accessible. I. Organisation each year in Paris of the largest French film market: the “Rendez-vous with French Cinema”; presence at the major international markets (Cannes, Berlin, Toronto, Los Angeles, Hong Kong…); and support to foreign distributors for theatrical releases of French films. II. Increasing foreign journalists’ awareness of French Films (with the organisation of press junkets with French artists), as well as increasing awareness of foreign exhibitors to French cinema at exhibitor congresses in a dozen countries, and film buyers for connected TV and Web platforms. III. Organisation of French film festivals in 10 strategic countries (United States, Germany, Italy, United Kingdom, Russia, Japan, Brazil, China…) and on the Internet (MyFrenchFilmFestival.com) throughout the world; active support of French cinema at 60 international festivals (Cannes, Berlin, Locarno, San Sebastian, Pusan…). IV. Organisation of masterclasses given by French directors in foreign film schools and universities in a dozen countries. 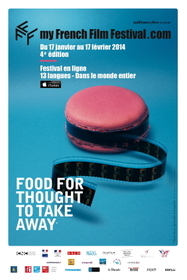 V. Promotion and subtitling of French shorts at festivals, markets and on the Internet.